An awesome company, Bonfire Funds, has partnered with SaveMitchell.com to launch a fundraiser. 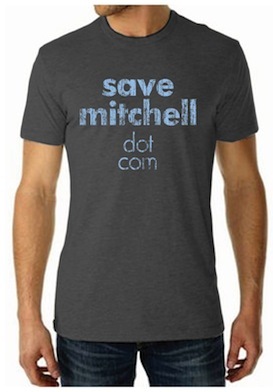 People purchase a t-shirt for $25; $15 goes directly to the SaveMitchell.com fund which helps offset his medical expenses. But here’s the catch…we must sell 50 shirts within 50 days. If we don’t reach that goal, then nothing happens. But if & when we do reach our goal, then everyone who placed an order will have a t-shirt shipped to them, credit card will be charged, and a total of $750.00 will be donated to Mitchell Lyne to help keep him alive! Sure, insurance and Medicaid pay for some of the healthcare costs (while dishing out headaches)…but certainly not all of it. And then there are the everyday costs that add up over time. An example is the amount of paper towels & trash bags that are used up due to his dialysis treatments & cleanings. Mitchell’s Mom goes through an entire roll of PT daily, which in turn fills up an entire bag of trash. If you do the math, that is $7.49 for a 6-pack of Bounty paper towels & $5.00 for a 30-pack of trash bags, or over $35 per month. And let’s not forget the cost of gas these days…to & from doctor’s appointments, dialysis clinic check-ins, trips to the grocery store and pharmacy to fill prescriptions. The expenses are hard for anyone to keep up with, let alone a family who has dedicated every minute of every day to keep their son alive. So please consider paying it forward and purchase a t-shirt. And let’s be very clear…this isn’t any ol’ shirt that festivals hand out as freebees. The “Cotton Ringspun Fashion Fit Tee” is high-quality material, fits like a glove, and is super comfy. You do have the option to purchase a standard (boring) “Cotton Basic Tee” but it’s the same price so why not get the best bang for your buck donation!? Click here & Visit the site now, time is running out.